As I promised, here′s the simple and short way to get as many great keywords as you wish. So here′s where you find Rank Tracker: http://www.link–assistant.com/rank–tracker/. You can trust the software I recommend here 100%, for I not only used it thousands of times. I truly took part in its development, consulting the Link–Assistant.Com team all way through. So these tools are also products of my SEO experience. Hundreds of SEO companies and thousands of individuals all over the globe use this software. Many of my clients do part of the job themselves, with the tools I recommend. And believe me, these development guys know how to keep all their users happy! Run the tool and click the New button to create a new project. 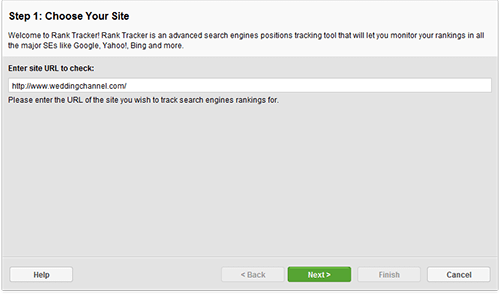 Rank Tracker will ask you to enter a URL, so enter your site′s URL. Then choose Search Engines to apply (in fact, you can click any, say Yahoo! — it doesn′t really matter for keyword research). Note that Google, Bing and Yahoo are selected by default. There′s also a filter in the upper right corner using which you may quicker select the preferred Search Engines. Now you need to enter a keyword to start with. Rank Tracker, being a smart tool, has already found some ideas for me! 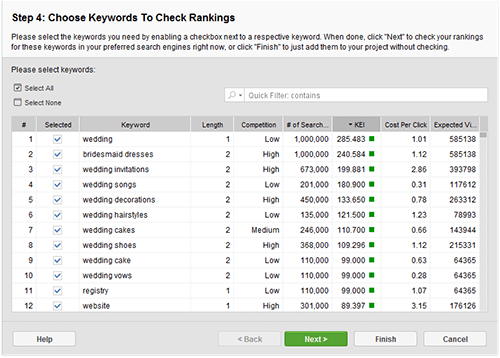 To extend the list of pre–selected keywords (wedding planning, wedding websites, wedding registry), you should type in any keyword related to your business, l ike I typed in wedding ideas, and Rank Tracker will take a couple of seconds to check your site′s ranking for that word (but I′ll save talk about rankings for later). What you need to do right now is: select your keyword and click the Suggest button in the Keywords tab. You can enter a number of generic keywords related to your niche or business. Rank Tracker will use these terms to give you keyword suggestions. 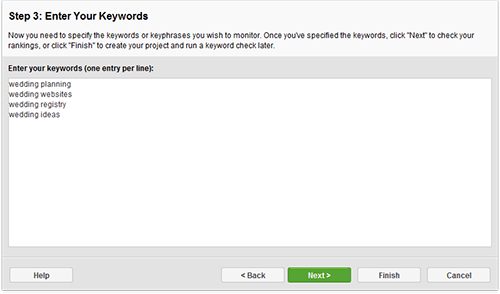 The tool will ask you to choose a keyword research method. Choose Google Suggest, and after Rank Tracker stops searching (it can take a while, on the number of keywords you′ve entered and the speed of your Internet connection), you can choose any of the keyword suggestions it offers. I′d recommend you to select all suggested words for now. And later Rank Tracker will let you easily single out the best–quality keywords. As soon as you make up your mind and click Finish, you will see the keywords you chose in the Keywords tab. 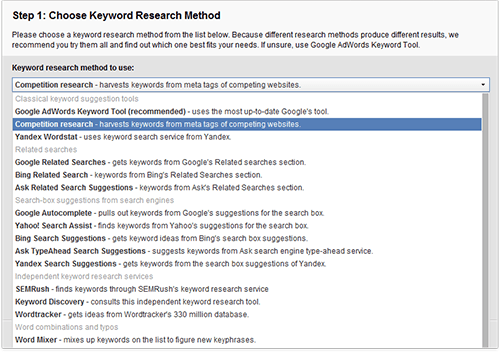 Now, repeat the same procedure choosing all the necessary keyword research methods like Wordtracker, Yahoo! Search Assist and Ask TypeAhead Search Suggestions. Your keyword list is getting longer, yeah? Spy a bit more on your competitors, but now — with the help of Rank Tracker! Now let′s add some regionally–marked keywords to your list. You′ve probably read above, it′s sometimes very useful to localize your keywords, as people often search for products or services exactly in their own area. So here′s what you need to do now: select some keywords from the list you already have (hold Shift or Ctrl buttons for multiple choice), then click the Suggest button of Rank Tracker and choose the Word Combination option. After that on the left you will see the list of keywords you′ve just selected. Now your task is to add regional names to your list. Say, if you sell footwear in Michigan and Illinois, type in the names of these two states in the right–hand field. Enter one local name per line. Then click to proceed and after a few seconds you′ll have a list of fairly good regionally marked keywords. 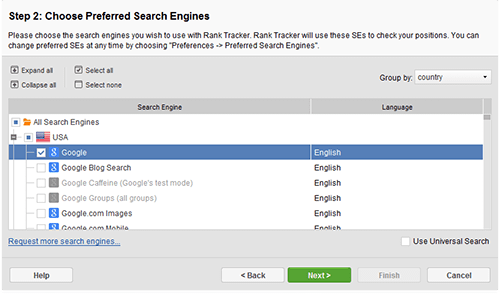 Now I guess, you′ve gone through the Rank Tracker options and made a massive keyword list. But Rank Tracker still has to do some work for you. Now, if you repeat the procedures for finding keyword suggestions, you′ll add more straight–to–the–point keyphrases to you list. Thus you′ll have enough reasonably precise search terms to choose from. DO IT NOW! Make a massive list of keywords and keyphrases for your website in Rank Tracker, and copy them all into a column in a spreadsheet (ex. Excel). So what do we have at the moment? A huge list of keywords, all you could find. Well, you must be proud, thinking how big it is. Now here′s the confusing but funny thing: you won′t need most of this list! The time′s come to think of keywords′ quality. As a next step, we′ll shortlist your keyword suggestions. learning..just downloaded the tool...as a new comer. I previously used Keyword Researcher Pro. "Rank tracker" is very useful program. 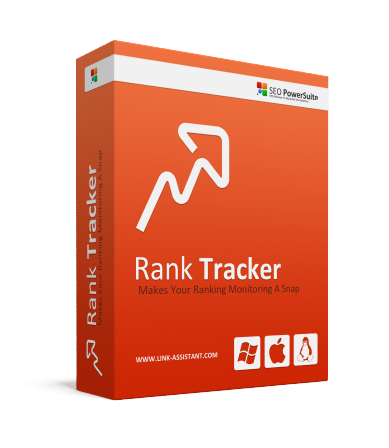 Rank Tracker it is one of the best SEO tools, together with the other 3 tools from the SEO Power Suite. Hello, does RankTracker work with Russian language and Yandex.ru? Yes, sure. Rank Tracker supports the Russian language, has reports in Russian and also has Yandex in the list of supported search engines.